To begin with, the headline is erroneous. We have had adequate supply of most drugs in the hospital. The content in this article is solely about the Chemotherapy Unit. There is one doctor (Dr. Gathua) rotating in the Chemotherapy Unit. One pharmacist (Dr. Munene) based in the Unit. One Nurse trained in Oncology. Recently posted a nurse who is undergoing part-time training in Aga Khan Hospital. ·We have been unable to sustain procurement of chemotherapy drugs since they are very expensive in the market and they are NOT available in KEMSA. The MOH was to supply us Chemotherapy Drugs. ·Dr. Mbuthia the oncologist is back (last week) from her studies in India. ·The hospital does not only have one pharmaceutical technologist. The hospital has 7 pharmacists and 1 pharmaceutical technologist. The hospital is not ill equipped or poorly run. 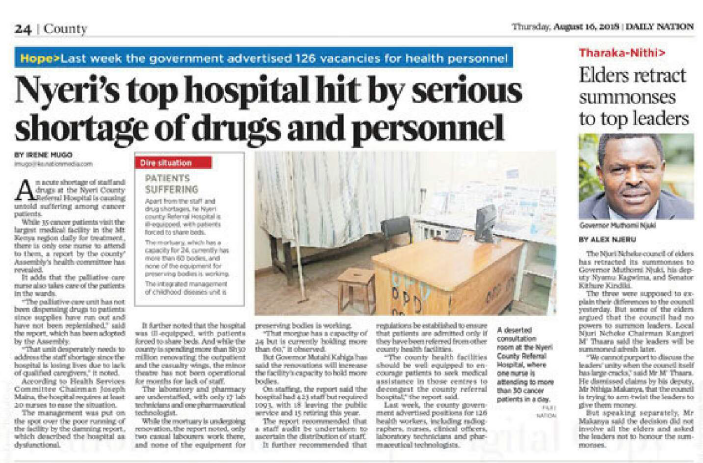 We have other hospitals in the county and patients prefer to come to Nyeri PGH since they receive good care. Shortage of staff is a national concern and it’s NOT specific to PGH only. Note : All the chemotherapy patients (32) do NOT all come the same day. The staff available are currently able to manage the unit..